This is a nice kit for any beginner electronic cigarette smoker. 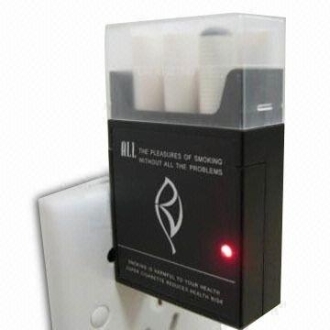 The entire pack conveniently plugs right into any wall outlet to charge your battery. The battery screws directly into the ePack in order for it to charge. The ePack case will hold one battery, one atomizer and 5 cartridges. The epack case, itself is only available in black. Click Here For 510 Pcc Pack Kit. NOTE: Joye 510 batteries have a 180mAh capacity. They will need to be charged throughout the day after using them for a few hours. The initial charge must be for 8 hours. When recharging your batteries, only do so for 2 to 3 hours maximum.